Us V. Them – More Aloha, Please! With all the animosity between Bike Commuters, Rollerbladers, Mopeds, Pedestrians, Car, Trucks, Buses, and Trolleys encountered on my daily commutes, I’m surprised that others haven’t realized how far a little Aloha can go! In past weeks, presidents galore have been abounding in Honolulu, clogging up the streets, protesting, making front-page headlines, and creating extensive roadblocks in Waikiki and Ko’Olina thanks to APEC (Asian Pacific Economic Craziness). Here are some tips for the world citizens to help keep their sanity in traffic: Ride Aloha, Live Aloha! Thanks for the photo, Kate B! I had the same one on my BMX, but it cracked and died. 1. Bike V. Pedestrian – Cyclists, a bell or a shout out is helpful here. If you start getting bike path rage along Ala Moana beach park, consider RL’s advice and take it slow… If auditory warnings are being blocked by impenetrable headphones and Lady Gaga earwaves, wait for a large enough opening and zip past without giving them the finger! Pedestrians, “on your left” does not mean jump direcly in front of the bike. Just one-two step to the right to allow the cyclist to pass you on the path! Courtesy shaka as you pass for good measure! 2. Bike V. Car – I’m going to share my all-time favorite bike commuter Aloha move that seems to put traffic-angsty drivers at ease. It’s like a Bike Side-Step. So you’re riding in the right lane (I like to ride aligned with the back right tire of cars, a tip I LGRAB’ed from Dottie) and you come to a stop at a red light. You are first on the line with cars behind you. I turn around, do some attmpeted sign language to determine if the driver wants to turn right (blinker, what’s a blinker in Honolulu?) and then move over to the left side of the lane to allow the car to pass. Wave and smile to encourage the driver to pass through… Even if they cannot make the right turn before the light turns green, this move is like when your grandma gives you candy in church – an unexpected surprise that makes church tolerable and makes you adore your grandma! Strangely enough, my grandma was diabetic and I had ADHD, so I’m not sure if it was a good idea for everyone else, but I thought it was awesome. Who drew these cheesey cartoons!!? Will they draw one for me of the Bike Side-Step?! 3. Bike V. Bus: Some people tell me horror stories of drivers of TheBus in Honolulu, how they intentionally persecute cyclists up hills, or honk and scare the living sh*t out of you when they zoom past. Some people tell me stories about a-hole cyclists who almost ran them over on the sidewalk as they stepped off the bus. Well, Some People, have I got news for you: some cyclists are a-holes, and some bus drivers are a-holes. Major Digression/Minor Rant: I don’t think I am an a-hole cyclist, so don’t tell me this story expecting apologies. Similarly, I would not tell stories about terror-children on 8-hour international flights to my friends with kids expecting airline vouchers. So, lovely Bike Commuters, consider several options to deal with the Bike V. Bus scenario. I often avoid streets laden with bus thoroughfares and opt for the back roads. Or, you can just slow down a bit to avoid bus-frogging all the way to your destination. As for the honking, this can’t be avoided! Apparently it is a local rule that buses honk twice to alert cyclists that they are passing. Hold on to your spandex for that one, Honolulu commuters, HBL already asked the Dept. of Transit to delete that rule from the training book when we met with the cartoon mayor… TO NO AVAIL! 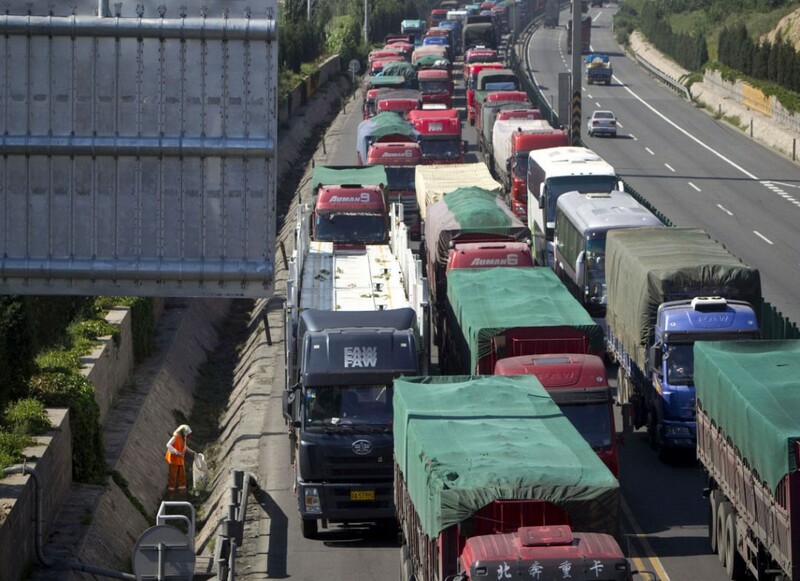 Beijing 2010: longest traffic jam ever on the way to grand opening of City Wok! Ladies and gentlemen, I have found the holy land…and it exists in the quaint Germanic-heritage town of New Bremen, Ohio. 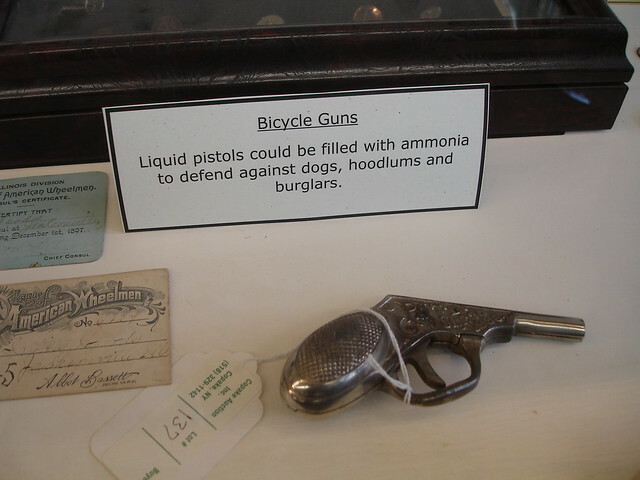 A few weeks ago, my family and I made the trek to New Bremen to visit the Bicycle Museum of America, and I wanted to share some of the sights with you. 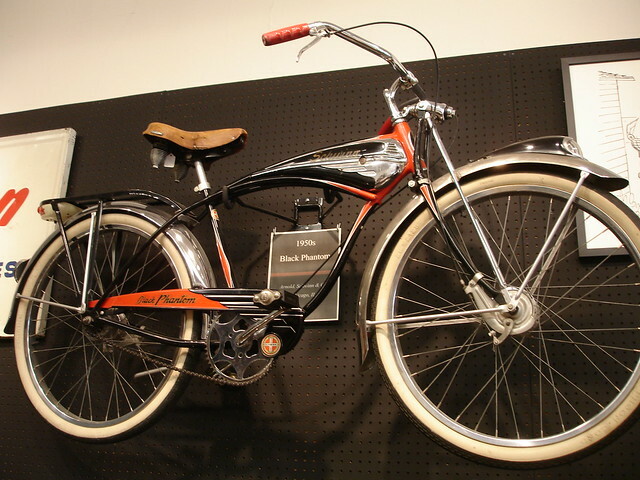 The Museum got its start in 1997, when Jim Dicke III, president of Crown Equipment Corporation, purchased the Schwinn family’s personal collection of bicycles and bike memorabilia in Chicago during the family’s bankruptcy proceedings. 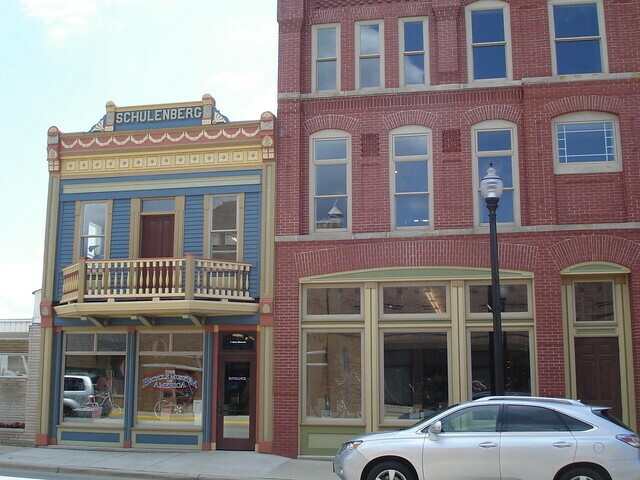 Dicke moved the collection to New Bremen and established this incredible facility not long after. 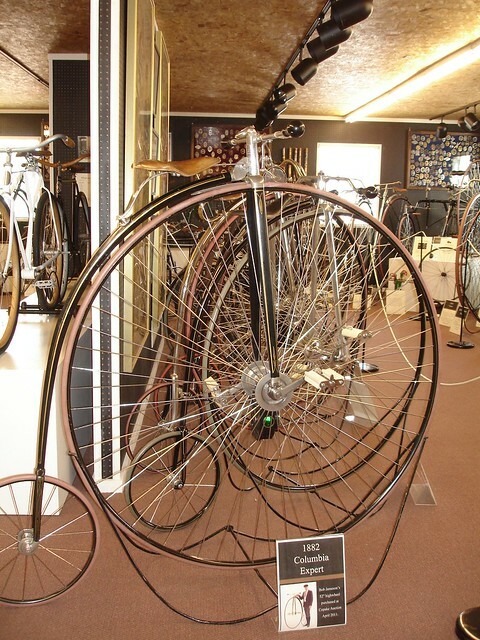 The Museum covers the entire range of bicycle history, from draisiennes all the way to modern road racing machines and everything in between. 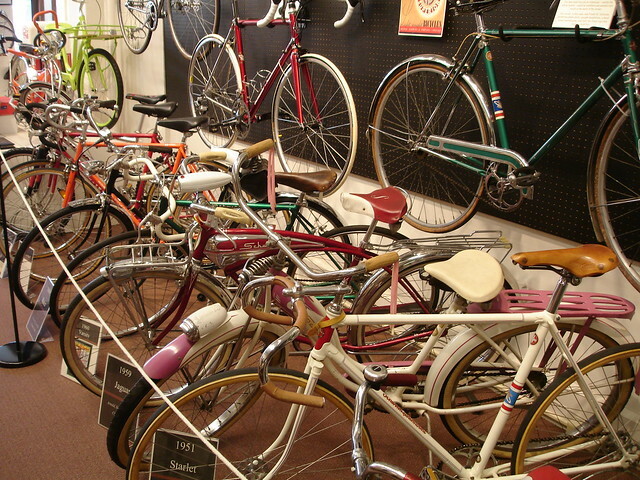 The museum’s collection is somewhere around 300 bicycles on display at any one time, with a rotating stable of over 1000 to choose from. 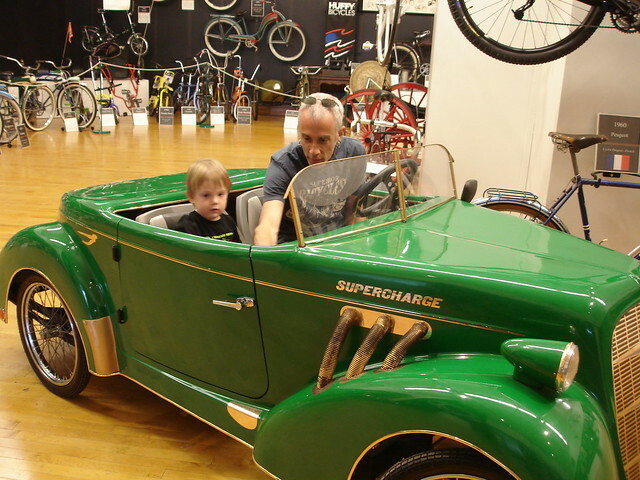 The building is packed to the gills with bikes, tools, memorabilia, historical artifacts and so much more — it almost defies the imagination. “Why Ohio?”, you may ask, and that’s a good question…one I posed to the staffpeople I met there. 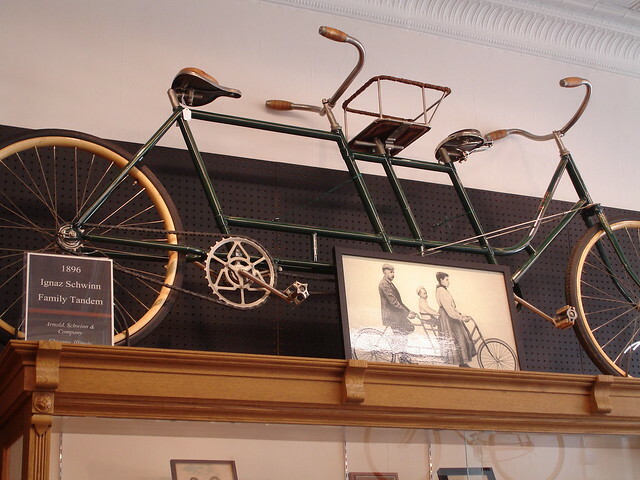 The more I thought and heard about it, the more it made sense…after all, two very famous bicycle builders/sellers made their home about 40 miles to the southeast. 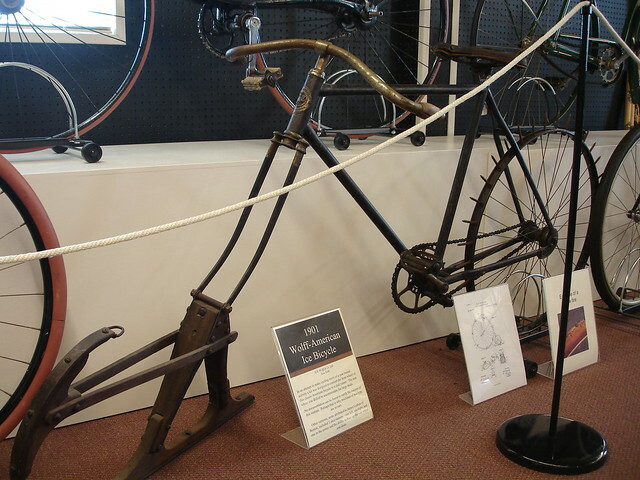 Also, a number of legendary bicycle companies were based in the general area, including the Davis Sewing Machine Company, which is better known to bike historians as the company that produced Huffy bicycles. 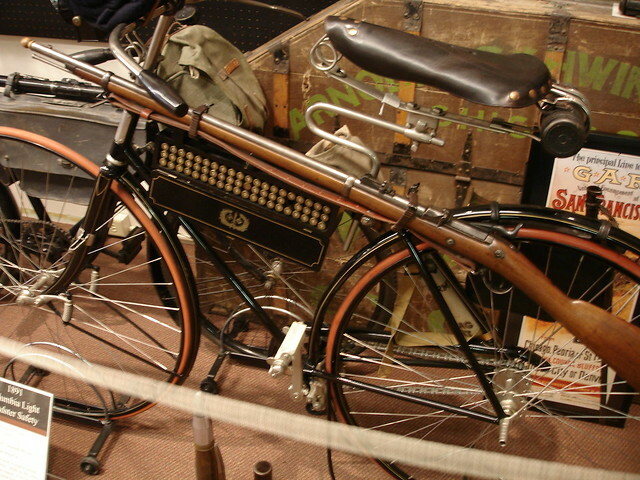 In addition, the Cleveland Welding Company produced bikes we all know and love by the brand name of “Roadmaster”. 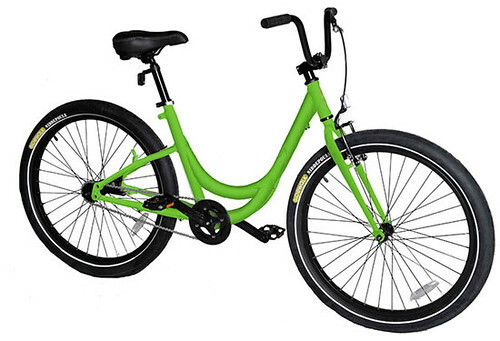 You may also know that online bike retail giant Bike Nashbar is based in Ohio. And, the state is crisscrossed with bike paths, trails and quiet country roads and is a surprising hotbed of bicycle action…who knew? 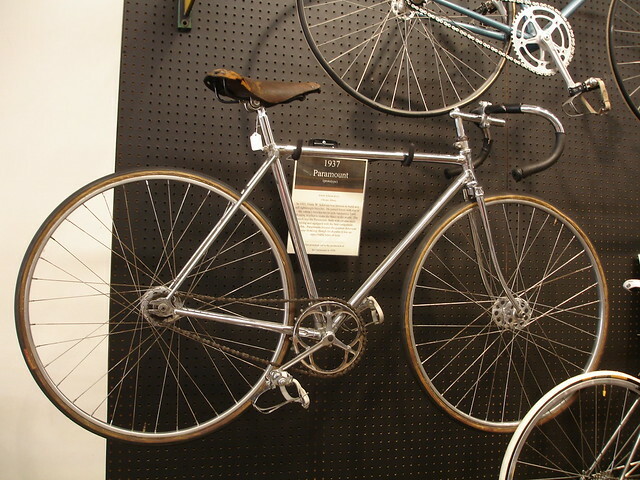 Notice the stunning chromed bracing on the bike in the foreground, and the brass bracing on the hickory-framed bike in back. 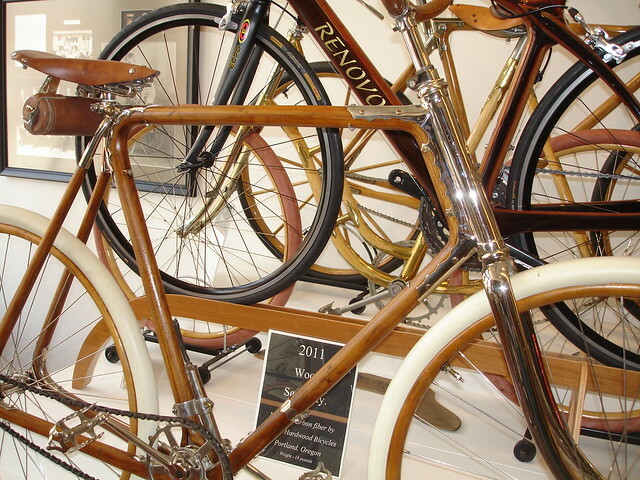 Both of these vintage machines sandwich a gorgeous Renovo made just a couple of years ago…what’s old is new again in the bike world! 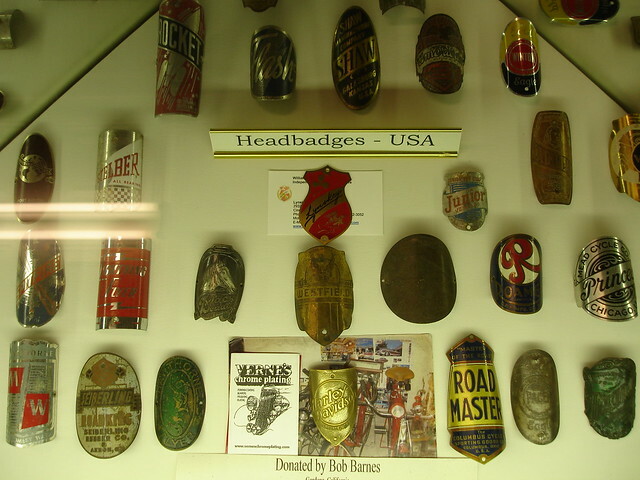 Here’s something unusual in one of display cases in the Museum — another accessory that may come in handy on the daily commute. 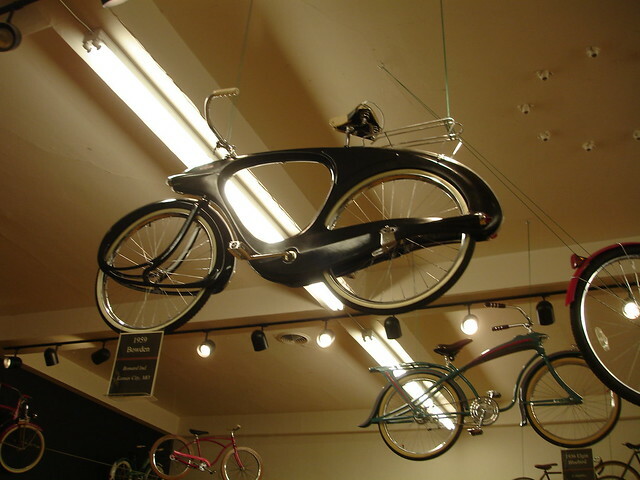 You think Planet Bike should resurrect a thing like this? 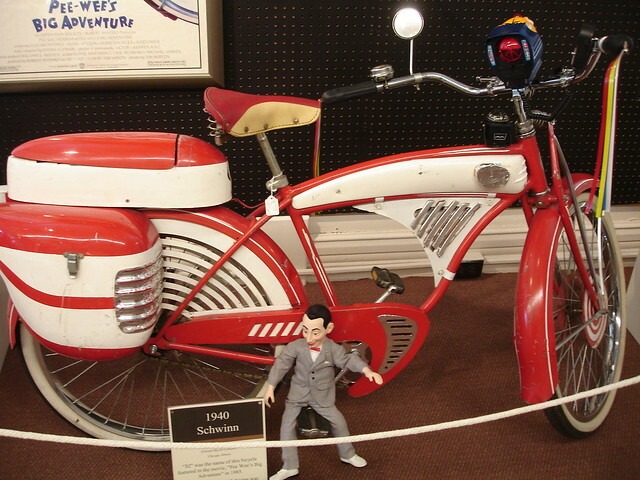 The Pee Wee bike was a special treat for me, as one of my Tampa neighbors and I watched the Ebay auction for this very bike a few years ago…we’re both big Pee Wee Herman fans, and we were blown away by how high the price went ($20K+, as I recall). 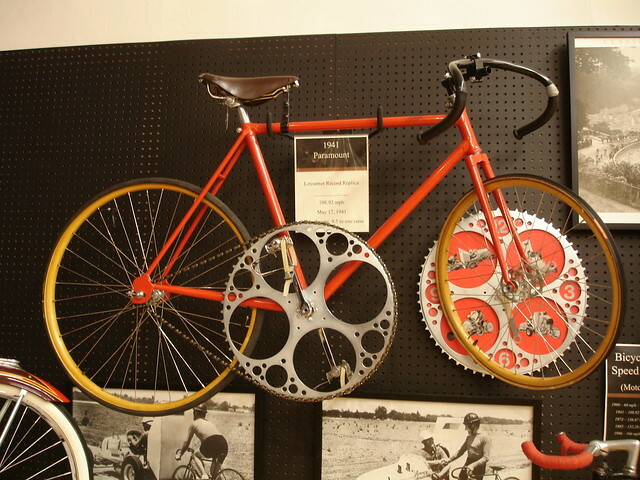 It was wonderful to see this bike in person years later. There is so much more to share — I took nearly 150 photographs, and I could have spent a week inside the building, gazing into cases and trying out some of the displays. The Museum staff was incredibly knowledgeable and friendly, even offering us restaurant recommendations at the end of our tour. I wholeheartedly recommend a trip here if you’re in the area — there is truly something for every bikey fan out there contained within this facility. For the rest of my photos of the Museum, please swing on over to my Flickr stream to take a look. We will return to the Museum soon…the rotating display means that there will be something new for us to enjoy on our next visit! DOUBLE TEAM: You read it right Bike Commuters! Elizabeth and I will be meeting up for a/some ride/s this weekend! What you say? Are Honolulu and Chicago neighbor cities? Hardly… BUT, I will be attending a conference in Chicago from Thursday through Sunday of this weekend. Therefore, Bike Commuters will DOUBLE TEAM in Chicago for awesome bike bloggy-ness. We may even meet up for a ride with Dottie from Let’s Go Ride a Bike… in which case, we would consider that a bike triple team. We’re working on a loaner bike situation for meeself (anyone out there have a spare bike size 47cm or 49cm?) or I may rent a bike nearby my hotel at Millenium Park from www.bikechicago.com. Maybe I should bring those pants that look like pants for extreme heat testing! 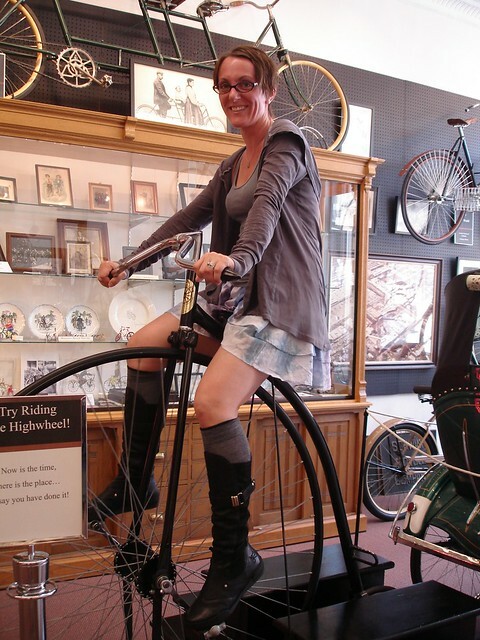 Rent a Bike instead of a car for business travel... Hmm, Segway OR Trek!? That's like Cuttlefish w/asparagus OR Vanilla Paste. This will be the first time I will be “business” traveling with bike in mind… I’ve visited friends and done the bike/public transit combo in Seattle and California, but never for work! Bring it on hot and humid Chicago: I’m ready for that sweaty back. Does witch hazel come in a 3 oz. travel container!? FACT: Elizabeth is officially the only cycle lady I know in all of the Middle West. (Chicago is the Midwest right? Being a California Native, I hadn’t driven further than Tahoe for most of my life, I used to think everything between California and New York was the Midwest… only to be corrected by an ex-boyfriend from Montana in college.) Looking forward to taking the heat: Elizabeth + Mir.I.Am = ultimate Bike Commuters blog time weekend!!!! We will not be creepin' around Chicago like this player! Is PeeWee a bike commuter? 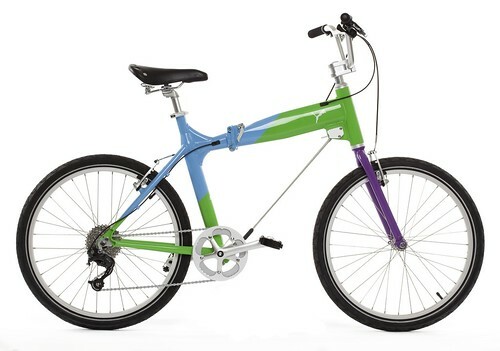 I’ve noticed lately that more and more commuter bicycles are being made with loud and bright colors. Personally I like my bikes to be somewhat low-key so it flies below the radar of bike thieves. 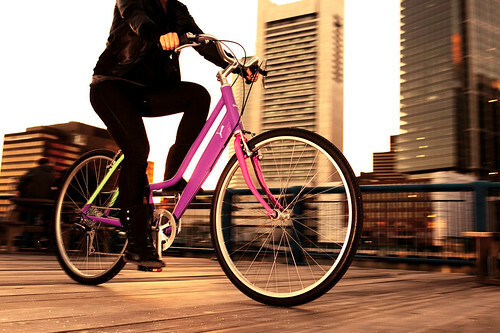 But check out these photos of some really colorful bicycles. This was a custom built bike from Road Warrior Bicycles in Fullerton. A Puma bicycle that folds and uses a cable as a downtube. What’s your personal take on this? 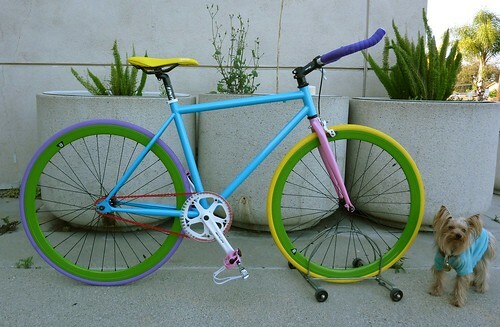 Is your bike colorful? If not, what color is it?